THERE ARE vacant seats on NUJ Councils that meet periodically to formulate union policy in its various sectors. Vacancies are open to freelance members who work in particular industries, who represent a particular geographical region or belong to a specific demographic. Of interest to LFB members - the Freelance Industrial Councilseeks a member from East Anglia. The New Media Council is looking for a South East England rep.The Photographers' Council has a vacant London seat and one for the South East, as does the PR Industrial Council. The Union's National Executive Council (NEC, its decision-making body) has vacancies for a member working in books and two based in South East England. Candidates need to have nomination forms signed by an NUJ Branch, sent to arrive by 22 May. To seek LFB's nomination, contact its Secretaries (Phil Sutcliffe or Tim Gopsill in plenty of time for it to be put to the 15 May Branch meeting for a vote. 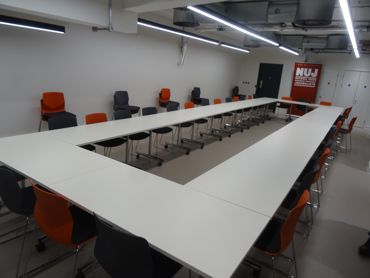 For more details of all NUJ Council vacancies and eligibility, ask by email to the NUJ's Leyla Yusuf for the Circular on Casual Vacancies. There are a couple of vacancies on LFB's own Committee too, see here.